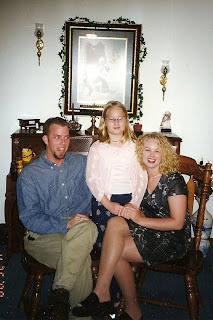 This photo was at our wedding shower in 1999. She was one of my bride's maids! Isn't she such a cute little thing! My, how things change. Not the cute part, just the little part. She has become a woman of beauty on the outside and more importantly she is beautiful on the inside. It makes me happy that my Lou, Lou and Ladybug have someone like her to look up to! She is not only beautiful but she is also very intelligent and one of the funniest people that I know. She is quick witted and has a dry humor that has me laughing my head off whenever we are together. She also sings like an angel. I mean it. Seriously. The girl's got skills. Most importantly, she is a woman of faith and substance. She knows what she believes and why she believes it. She has had trials that have strengthened her character and she has a family that adores her. She is one of those people that can do anything that she puts her mind to and I can't wait to see what she will become with all that opportunity at her fingertips. So, Happy Birthday to my (not so) baby sister! I'm so proud of the woman you are and will continue to become! May God bless your life and may you always seek HIS face! I LOVE YOU! Aw thanks sissy! I love you!